"They have turned this into 'Apocalypse Now on Ice'!" Growing up, I played several sports in my middle and high school years. There were the obvious activities (football, basketball) but perhaps most surprising to my friends and family was my involvement on the area hockey team. I never told anyone of my true desire each time I laced up my skates; now, this seems as a good a forum as any to let the cat out of the bag. I wanted to be the long lost Hanson brother. Having seen the original 1977 classic Slap Shot more times than I care to count, I found myself thrilled by the turning of a hockey game on its ear by dehumanizing and downright violent on the ice. Here was a film, voted one of the top ten sports films ever made by the likes of ESPN, Sports Illustrated, and The Sporting News, shamed by the idea of a sequel with none of the key players returning. But my love of the original had me hopeful, and like a breath of fresh air came the loveable Hanson brothers. Those hopes were dashed after viewing the film, but that is not to say that Slap Shot 2: Breaking the Ice is a total waste of time. Set an undisclosed number of years after the original film, SS2 finds the Charlestown Chiefs in the midst of financial distress. The team is losing games at a staggering rate and the players are treated with as little respect as possible by both visiting and hometown crowds. Leading the team is one-time star Sean Linden (Baldwin), a washed up former pro who seems content goofing off and earning a paycheck while his fellow team members collapse their careers around him. Soon, there seems to be a beacon of hope as the team is purchased by Dean Claremont (Busey), a media mogul who wants to form a Harlem Globetrotters-like league around the Chiefs. With a female coach (Steen) and the ever-popular Hanson brothers, the team reluctantly agrees to move to Omaha, Nebraska to rebuild their careers. Only the Chiefs won't be the stars, rather the punch line to a group of clean-cut Ivy league stars to the pleasure of thousands of fans. To be fair, I did laughed quite a bit. The stripped down truth is that without the humorous Hanson brothers and some exciting hockey sequences, the film is as close to a predictable bore as you can possibly get. Will the Chiefs will fight back? Will Linden regain his faith and love for hockey? Anyone curious to the outcome of these questions is undoubtedly living under a rock, on the moon, in another solar system. I also have problems with the stereotypical "female coach at odds with her new players" story line. Turned on it side, would an all-female hockey team be angry with a male coach? Probably not. The bottom line for me is that male, female, or both: Who cares about the gender of a leader as long as they are good at what they do? Aside from problems with the plot, the overall experience of viewing SS2 has its rewards. As mentioned above, the hockey sequences are nicely directed and choreographed (director Stephen Boyum was a stunt coordinator on The Mighty Ducks series), but at times they lack the hard-hitting impact needed. The cast is good, but not great. Stephen Baldwin sort of stumbles (or is it mumbles?) through his part and I never felt involved with his leadership of the team. There just isn't much chemistry between him and Steen, which might have helped. However, through it all there are the Hanson brothers, who single-handedly save the picture. It is a safe bet to say that the filmmakers brought them back for the sequel to draw fans of the original to this new material, and hey, it worked. Acting as a sort of Greek chorus, the trio arrives and departs from the script purely for matters of convenience; their scenes have more energy in a single frame than the remainder of the film does without them. Image Transfer Review: Presented in an anamorphic 1.85:1 widescreen ration, Slap Shot 2: Breaking the Ice looks great. Sharpness and detail are nicely done with very little edge enhancement noticeable. Colors are rendered perfectly, with the blues and reds of the jerseys looking fine and no evident bleeding. Overall, this is a nice transfer with very few flaws. Audio Transfer Review: A surprising inclusion of both Dolby Digital 5.1 and DTS sound mixes makes this one of the more enjoyable sound mixes I have heard in some time. While not booming with directionality and effects, the mix is enveloping in its design; the arena ambiance is perfectly transplanted into your home theater. The surround channels are active with cheering and the musical score, while the dialogue sounds crisp and clean out of the center speaker. One flaw is the low-level mixing on the left and right speakers and—although this may just be my copy—these two channels seem out of tune with the others. A face-off between the DTS and Dolby Digital mixes provided no clear winner, but the hockey scenes have a bit more crunch in the DTS mode. Extras Review: A few extra features are offered, which is a rarity for straight-to-video films. First and most notable is an interview with the Hanson brothers, who will forever be known for these roles. The interviews are short, but the three are such fun loving guys that there is a certain charm about this feature. Next is a thirteen-minute making-of featurette entitled The Making of Slap Shot 2: Breaking the Ice, and if you want to get an idea of the film in a short span without actually viewing it, this is your baby. Interviews and clips make up this overly promotional piece. A short video trailer for SS2, as well as production notes and recommendations are included, but no trailer for the original film. 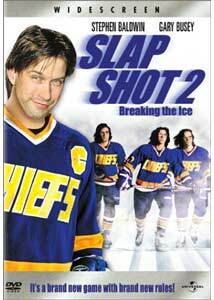 The inclusion of the Hanson brothers makes recommending Slap Shot 2: Breaking the Ice an easy rental choice. The DVD is nicely done for a direct-to-video piece and the inclusion of both Dolby Digital and DTS tracks is a pleasant surprise.